Decision: Should you play Abasoth's Withering? If you're playing Cursebreakers, you should probably be playing this card. Other spellcasting warbands can benefit from its inclusion, but the decision isn't as clear cut. "Hold objective" type decks from other warbands should probably leave this one in the box. Let's begin with the obvious: if your warband isn't from Nightvault, you shouldn't play this card. While this may seem like something that should go without saying, a player who picked up the game in NV and then grabbed a Shadespire army may not notice that they don't have wizards. So we're saying it. Of the four currently available Nightvault warbands, there are also considerations to be made. Each of the four has a single level 2 wizard, but only Cursebreakers has any backup wizards if your leader dies. Unlike many of the gambit spells available, Abasoth's Withering is reasonably reliable even coming from a level 1 wizard - 67% of casts will succeed (as compared to 89% reliable from level 2 wizards). Additionally, casting Withering will inspire any of the Cursebreakers and allows you to score the warband-specific objective Harness the Storm. As such, Cursebreakers should probably consider Withering more strongly than other warbands. The three remaining currently released Nightvault warbands could also consider playing Withering, but risk having it fall dead if your leader dies. Zarbag's Gitz have a similar spell in the form of Jealous Hex, allowing them to double up on -1 wound spells for added consistency, which may be a small consideration in favor of playing both. Playstyle is a huge consideration when selecting cards. A card that is great in aggro may be terrible for defensive decks. Of the three dominant deck types at this time, "hold objective" decks probably benefit the least from Withering. These decks aren't focused on killing enemy units and are necessarily locked into certain positions on the board. Aggro and defensive decks, on the other hand, can both benefit from the undefendable harm provided by Withering - aggro to stack with their other killing tools and defensive to make up for their lack of more traditional methods of eliminating enemy models. Finally, you should consider mobility when you are deciding whether or not to play Withering - it's range-limited, so slower wizards like Stormsire may get less use out of it than faster wizards like Vortemis. Killing your opponent's models not only gains you a glory and reduces threats on the board, it feels good. Abasoth's Withering helps you do just that, in a way that was not widely available before Nightvault. 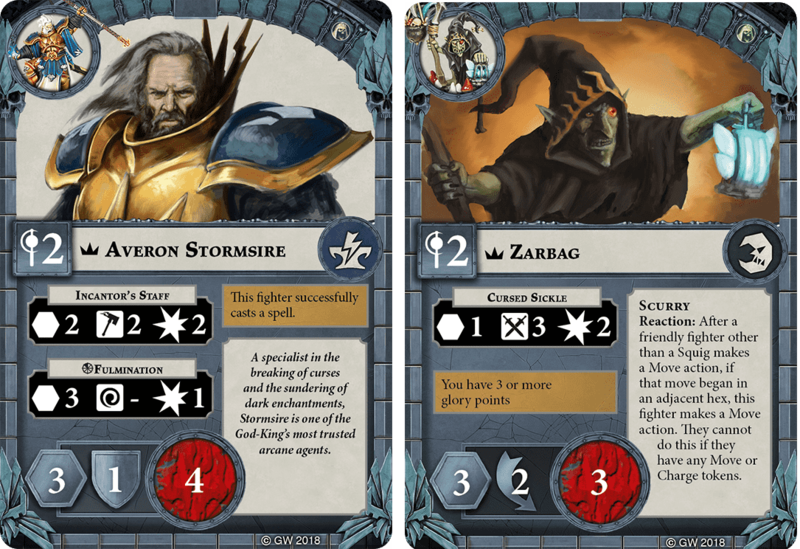 Prior to the release of Shadespire Season 2, effects that harmed enemy models and did not allow for defense rolls were extremely rare and often warband-specific. Enter Nightvault, which provided players with a plethora of new effects that harmed your opponent's fighters outside of the normal rules of combat. Until the meta settles from the drastic changes introduced in the last few months, it's definitely worth exploring any option that "breaks the rules" of standard interactions. As mentioned above, Abasoth's Withering is highly accurate, being essentially equal to an "axe" attack with a single support using a the same number of dice. This is a case where raw accuracy really matters, as the target fighter has no real way to defend themselves short of some very niche power cards that are highly unlikely to see play. As such, we should compare Withering to attacks after considering possible defenses. A quick glance at PrimalAce's excellent if inscrutable hit table shows that Withering cast by a 2nd level wizard is approximately as likely to land as the most mismatched basic attack on the table (5 "hammers" vs. 1 dodge). So, if you would play a ploy to make an 4-5-1 axe attack against an enemy, you should probably play Withering. The first thing to keep in mind when playing Abasoth's Withering (or Jealous Hex, for that matter) is that, according to the newest FAQ, Abosoth's Withering will never trigger an effect that requires a spell to take a fighter out of action. The target is considered to be taken out of play by a rules effect, not by your warband. This is in direct opposition to spells that deal damage, which are considered to be part of your warband for scoring objectives. In short, you can't score objectives like Advancing Strike or Victorious Duel if Abasoth's Withering results in the target fighter being taken out of play. Even Sorcerous Scouring, which seems made for these kinds of spells, can't be scored after killing an enemy model with Abasoth's Withering. While Abasoth's Withering can't directly score objectives like those above, it can facilitate the scoring of some less commonly used objectives. No Remorse, for example, is made much more manageable when used in concert with Withering. With the new proliferation of new 2-wound models and the resurgence in popularity of Skaven and Sepulchral Guard, it becomes quite easy to score No Remorse, even with a 2 damage attack. Crushing Force is similarly empowered by Withering, allowing even sub-par models to score it. You can also use Abasoth's Withering to set up objectives like Precise Use of Force and The Bigger They Are. Finally, if you are playing Honest Opponent for some reason, Abasoth's Withering won't foul your plans to score it, as it's gives a 'ploy-like" effect without being a ploy. One of the more subtle influences spells have on the meta will be seen in the prevalence of certain commonly played objectives. 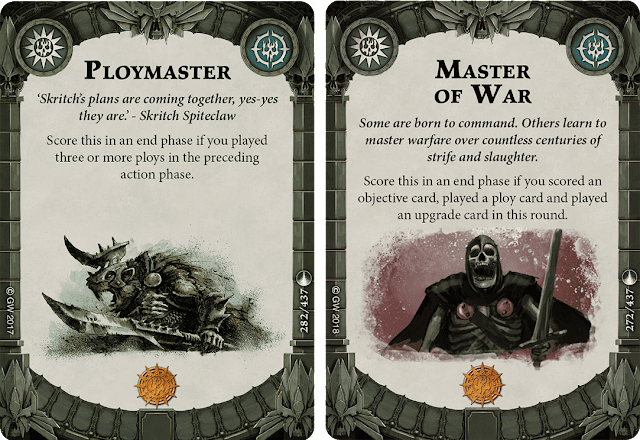 Ploymaster and Master of War spring immediately to mind as objectives that will likely see less play in the post-Nightvault era. We can examine just how spells affect these objectives using hypergeometric distributions. Hypergeometric distributions are used to determine success rates when objects are chosen randomly without replacement - such as when drawing cards from a deck. Let's look at Ploymaster first. If we assume a 20 card power deck (because we are not complete walnuts who play decks that are larger than the minimum) with 10 ploys and 10 upgrades, the likelihood that your first hand will contain 3 or more ploys is 50%. Furthermore, if your initial hand doesn't contain 3 ploys, your chance of drawing 3 or more ploys in subsequent hands increases. Let's examine a "worst case" scenario for scoring Ploymaster on first turn. Your initial hand contains only 2 ploys. You have two options here to attempt to score Ploymaster: draw additional cards during your activations or mulligan. If you choose to keep your hand and draw, your next draw has a 53% chance of being a ploy; if it's not, the next card is 57% likely to be a ploy. The likelihood will continue to increase in this way until you draw a ploy. On the other hand, if you mulligan your initial hand using the "do over" rule, you have an overall 57% chance that your second starting hand will contain 3 ploys. Now, let's see what happens when we replace ploys with spells. Replacing a single ploy with a spell (Abasoth's Withering, in this case) results in a whopping 10% decrease in the chance you will have 3 ploys in your initial hand. If we pursue the same paths as we did in the above example, the effect is even more noticeable. In this version of the deck, your first activation draw only results in a 47% chance of drawing a ploy, and the second drawn card is only 50% likely to be a ploy. Taking a "do over" in this case only results in a 43% chance that you'll draw 3 ploys. If you're planning on playing Ploymaster, you probably shouldn't play spells. Master of War suffers a similar, though less devastating, reduction in playability if you begin to include spells in your power deck. In either case discussed above, you will draw at least one ploy in almost every starting hand (98.3% of the time with 10 ploys, 97% with 9 ploys). However, if you continue to choose spells over ploys, the chance of successfully being able to play Master of War in any given turn plummets. In short, the inclusion of Abasoth's Withering - or any power card, for that matter - should be weighed carefully against your ability to score the cards in your objective deck. In this case, the replacement of a single ploy with a spell results in a significant decrease in your ability to reliably score a couple of common objectives. Abasoth's Withering is difficult to compare to other cards. Raptor Strike is probably the most absolutely comparable card; it has the same range, same effective "damage" output, and similar use restrictions. However, it being warband-specific means that it doesn't serve as a reasonable alternative for most decks. Similar things can be said about Jealous Hex - it's easy to compare to Withering, but only if you play Gitz. Additionally complicating potential comparisons is the fact that Withering can fail, unlike the vast majority of comparable ploys. As such, an effect like Trap is probably the best universal comparison. Trap is more comparable to Withering than several of the other damaging options for a few reasons. First, Trap is unable to score a number of objectives due to technical wording - particularly those that require an attack to take a fighter out of action. Second, Trap requires a successful (or at least tied) attack roll to trigger - much the same as Withering. However, it should be noted that if a given attack roll fails, Trap is not discarded without effect like Abasoth's Withering is if you fail your magic roll. 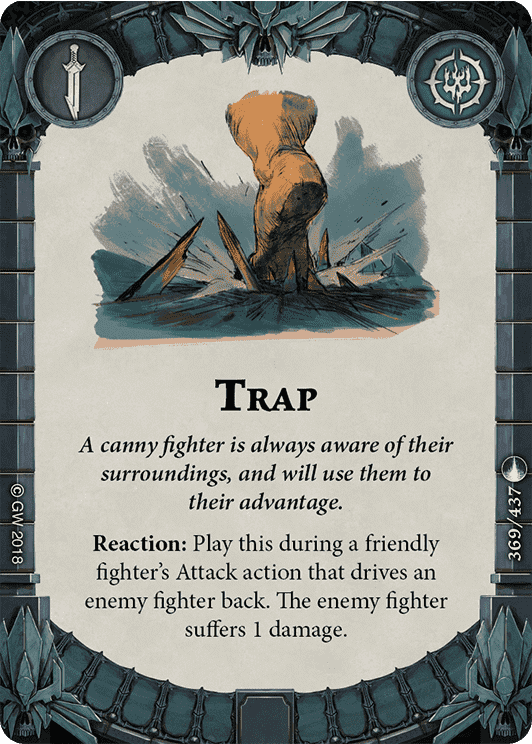 Finally, Trap compares well to Withering because it's combat utility almost certainly outshines considerations about its inability to trigger certain objectives. So, we know Trap is good. Is Withering just as good? Probably not, simply because of it's chance to fail. In any given round, you're likely to drive back an enemy at least once. No matter how many times you fail to do so prior to your success, Trap waits patiently for the opportunity to activate. Withering, on the other hand, is an all or nothing prospect. If you fail the roll, it's dead and does nothing. Other considerations exist, of course. You can negate the failure chance of Withering with innate dice rolls or the familiar/tome that allow you to consider one of your rolled magic dice as a Channel result. Additionally, Withering's 4 range beats Trap's 1 range hands down. These are all worth factoring into your decision, but in the end, Trap is probably a better all around choice. 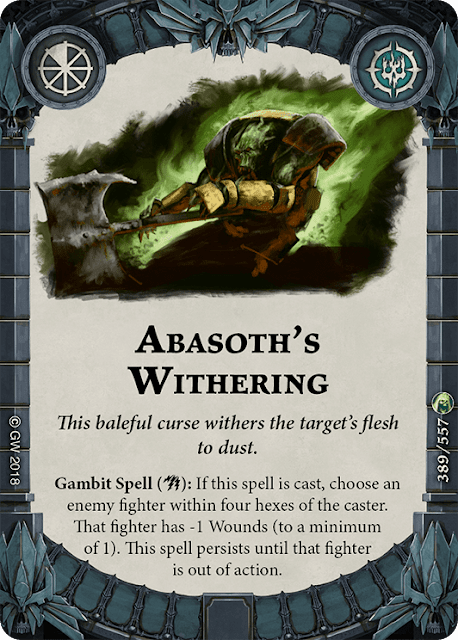 Abasoth's Withering grants us a whole new way to cripple opposing fighters. It's easy to cast and outranges all but 1 of the game's basic attacks. While it is somewhat neutered by the FAQ's rulings in regards to its ability to trigger objectives, it remains a powerful tool for those looking to take advantage of the ability to do undefendable harm to opposing fighters outside of the activation sequence. While better all-around options exist for almost all armies, Withering provides another tool to whittle down large units and destroy smaller ones; essentially serving as a 4th brother to the trap/pit trap/twist the knife family of actions for those warbands that can use it. It's not the sharpest saw in the shed, but it'll still cut down the cherry tree.